CTPF trustees (left to right) Ray Wohl, Lois Ashford, Jay Rehak, Tina Padilla and Jeff Blackwell at the January 17 meeting of the trustees. Substance photo by George N. Schmidt.Trustees of the Chicago Teachers Pension Fund (CTPF) vote unanimously at their January 17, 2013 meeting to stop investments in corporations that manufacture and sell dangerous firearms. The vote came a month after the trustees first proposed the move, following an investigation by the fund's staff and attorney to evaluate the best legal way to do the move. During the meeting, CTPF attorney Tiffany Reeves gave the trustees a report on the complexity of the proposal. She noted, among other things that weapons investments can include as wide a range of investments as antique firearms and corporations, some of which are among the largest in Chicago and the world, that produce both civilian and military products. The resolution was carefully crafted to take into account, as well, the responsibilities of the trustees to protect the interests of the CTPF annuitants and current teachers. CTPF is one of the oldest defined benefit pension plans for teachers in the USA. 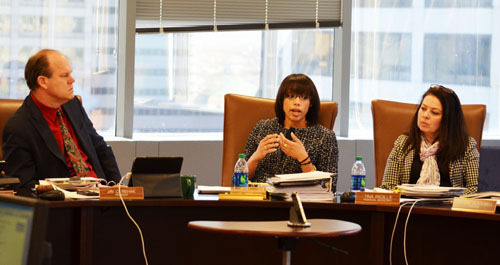 The current trustees include six teachers (elected by active duty teachers), three retired teachers (elected by retirees drawing pensions, one of whom is this reporter), one principal, and two members of the Chicago Board of Education. The two Board members were not present at the time of the vote on the firearms resolution. Chicago Teachers Pension Fund attorney Tiffany Reeves (center) explained the complexities of divestment from weapons manufacturers to the trustees at the January 17, 2013 meeting of the fund. Left to right above, Jay Rehak (teacher at Whitney Young High School and President of CTPF), Tiffany Reeves, and Tina Padilla (teacher at Lane Tech High School and trustee of the Fund). Substance photo by George N. Schmidt.THE RESOLUTION THAT WAS APPROVED JANUARY 17. "The CTPF Board recognizes that as a fiduciary it must act solely in the interest of the participants and beneficiaries of the Fund. The Board has an obligation to protect Fund assets and minimize the risk of investment losses. Consistent with its fiduciary duties, the Board is sensitive to the significant reputational, regulatory and statutory risks that may affect the shareholder value of assault weapon manufacturers. The Trustees hereby instruct the separate account managers to liguidate any and all public market holdings in retail assault weapon manufacturers as soon as reasonably practicable, and in accordance with the manager's fiduciary duties. "Further, the Trustees hereby instruct private market managers to review investment in retail assault weapon manufacturers, and work with CTPF staff to evaluate divestment options. "In addition, the Board hereby instructs staff to monitor the economic and regulatory environment, and work with legal counsel to develop comprehensive divestment and investment risk policies." Contrary to some reports, the CTPF trustees were working on the policy, which had been discussed at two meetings (one general meeting; one a committee meeting) since the tragic murders at Sandy Hook Elementary School in Newtown, Connecticut again brought the issue of "assault weapons" to public attention. Because CTPF does not invest the Fund's $10 billion directly, but through hired managers for various activities, the resolution above consists mostly of instruction to those managers. CTPF has long held policies about certain kinds of investments, as long-time trustee James Ward pointed out earlier. For example, CTPF divested from corporations doing business with South Africa during the apartheid days. CTPF also insists on minority, women-owned and local investments in its business dealings. I applaud the divestiture of stock by the CTPF in companies that manufacture assault weapons. Morally it was the right thing to do but only symbolically at best. We divested in tobacco and alcohol and we are still drinking and smoking ourselves to death. The problem is cultural and must be confronted with a long-term educational approach. Unless we change the way many of us think these conditions will continue to beset our nation for generations to come. The CTPF can sell its investments in companies that make what are called assault weapons like the AR15. But we all need to recognize the AR15 is a semi-automatic version of a military weapon that was created with all of our tax dollars because it was made to US Army specs. It was our government and military that created the basic blueprint for the AR15. Even dollars the CTPF invests in T bonds are driving in part the development of weapons. None of us can escape the reality of the nation we live in. But if it makes members of the fund feel better then so be it.